Martin, apologies for the “necromancy” of an old thread. You advise to use trisodium citrate to adjust pH in acidic juices (btw, its page 52 in your pamphlet, not 45 😉 ). Are there easy substitutes? I have no idea where to find trisodium citrate here in the UK. So so cool. Thanks for the recipes, ideas, and science. 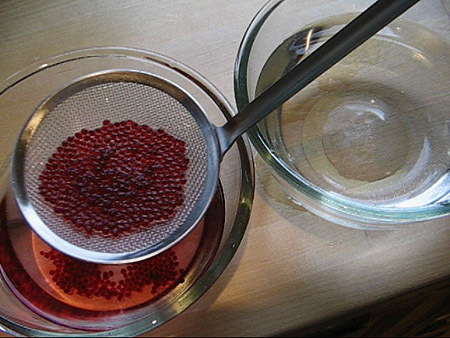 Was watching an old “Iron Chef” with Chef Cantu from Moto…..challange beets….it was the Iron Chef that used this tech however to make faux salmon roe. Just stepping into the molecular ring and this sounds like it is going to be fun. 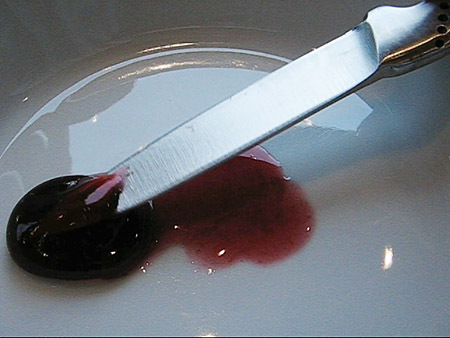 I am interested in using spherification in order to create a starter and wondered…. once made are you able to gently heat an ‘orb’ of liquid?? Maybe in a low temp water bath?? Maybe I am one the wrong path and need to use another method to achieve the same goal?? Matt: Yes – you should be able to heat it carefully. The calcium-alginate gel is heat stable. Is there a commercial name for alginate, or do I just walk into the pharmacy and ask for alginate? You could try. If it doesn’t ring any bells you may also ask for “sodium alginate” which is more correct. There are branded names as well: Algin (from Texturas), Algizoon (from texturePro), Gelesfera A (from Sosa) – just to mention a few. Thanks Martin… wish you could have seen the face of the assistant at the chemists here… I am sure they did not know whether I wanted to use it or sniff it! 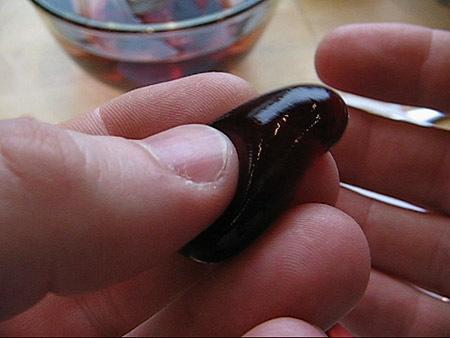 I found guar gum… can I replace that for the alginate? If the chemists have some biochemical training they might actually have heard about alginate beads gelled with calcium. 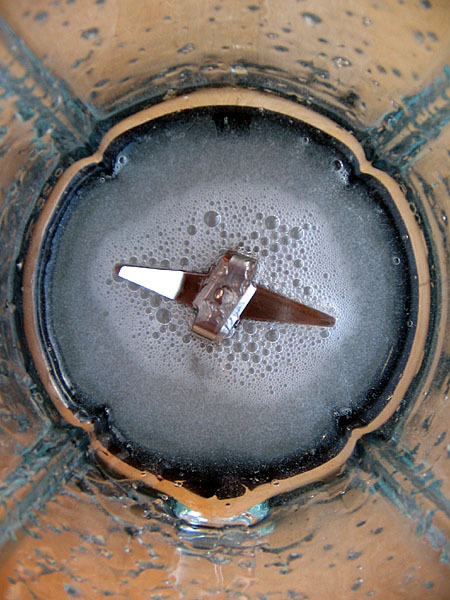 Amongs many things such beads are used to immobilize microorganisms such as yeast. 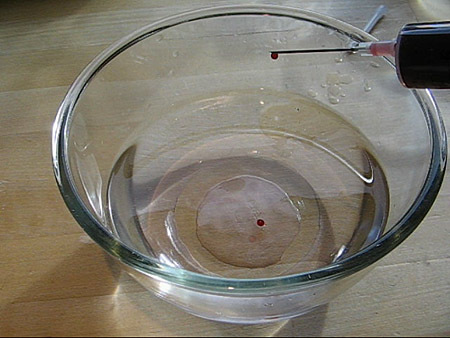 I combined the alginate and eater, mixed well with an immersion blennder, waited several hours, added the soy sauce to the solution. then prepared the calcium chloride bath. When I injected the alginate solution into the bath nothing happened. This was my first attempt at this and I don’t know if my formula is bad, is soy is not a good substance for this process or if my scale was inaccurate. Can someone review the above and give me dome idea as to where I went wrong. the alginate blend should be at least 2% weight by volume. So use 2 grams of Na-Alginate in 100g water. You dont even need to use a blender to dissolve it. At about 40 degC and continuous stirring, alginate will dissolve in about 20-30 minutes. There will be less bubbles hence, less waiting time. Also the calcium chloride drop should also be at least 2% (w/v). 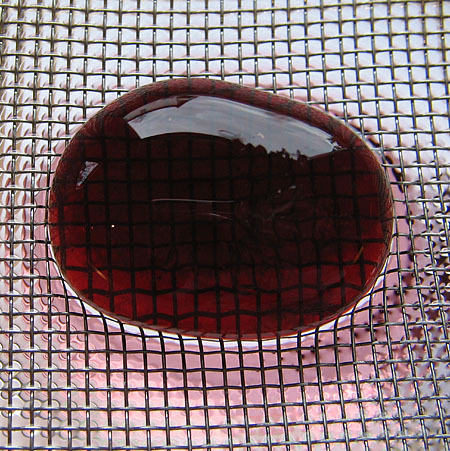 I followed a cola recipe in Martin’s free download hydrocolloid recipe book and everything worked perfectly. 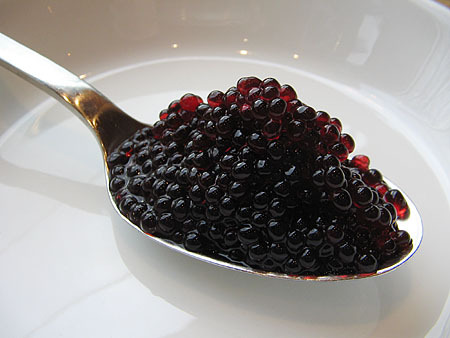 I substituted strawberry soda for the cola and ended with something that resembled Flying Fish roe. I had one down side and that was due to the calcium chloride bath. 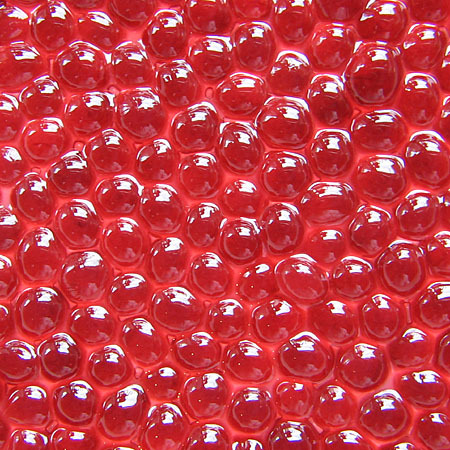 The spheres had a salty taste on the outside when you first put them in your mouth. I was using food grade calcium chloride and I even rinsed off the beads and let them soak in a larger bowl of water and they still had that salty taste on the outside. sodium alginate is way cheaper. Does anyone know if it will still work in an experiment? I’m making Instant Worms for second graders! Please help!!! where do you buy food grade sodium alginate? i not only want to use it for food but also for textile use. can you get it at a grocery store, if so what section? and what is the average cost for a decent amount. Apart from these I’d suggest you check out local gourmet shops where you live. In Europe some gourmet/specialty food shops do stock the Texturas series or similar products from texturePro, Kalys or other vendors. Regarding prices, my best advice is to check what the internet suppliers charge. This should give you a good idea of what the selling price is. I have a local supplier selling Sodium Alginate, food grade. But when I tried to order, he started asking about mesh and stuff. Any idea what is that? When mixing the sodium alginate into my desired puree, (Watermelon/Ginger, Lychee/Elderflower.) the alginate isnt entirely resolving, and when I tried it in my vita-mix on the lowest speed, it thickened quickly. Advice? The ratio’s were 2g Sodium alginate to 200 g liquid. When mixing the sodium alginate into my desired puree, (Watermelon/Ginger, Lychee/Elderflower.) the alginate isnt entirely dissolving, and when I tried it in my vita-mix on the lowest speed, it thickened quickly. Advice? 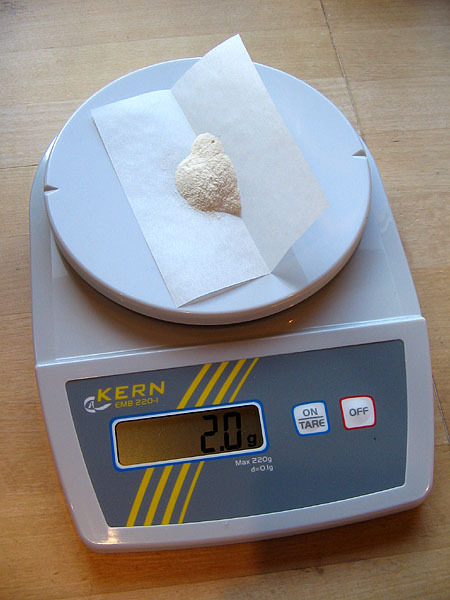 The ratio’s were 2g Sodium alginate to 200 g liquid.